Donald Trump, the President of the United States, came under fire this week for meeting with North Korean dictator Kim Jong-un. ONE does not make peace with one's friends. One makes peace with one's enemy. I wish I could claim these very wise words, but alas they belong to the late Israeli prime minister Yitzhak Rabin as he negotiated a peace agreement with Palestinian leader Yasser Arafat in the early '90s. 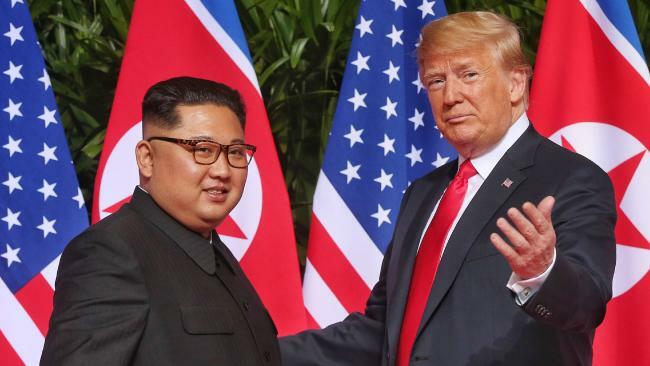 As Donald Trump, the President of the United States, came under fire this week for meeting with North Korean dictator Kim Jong-un, those were the words I couldn't help but reflect upon. Every corner of the globe has an interest in a world with more peaceful solutions and fewer nuclear bombs and maybe this week's meeting will make a difference. For those who think it's distasteful for Trump to meet with the dictator, whose regime is brutal, I can only say I understand those sentiments. To meet with him is to legitimise him; to meet with him with as much warmth as Trump did this week is problematic. But nothing changes by implementing the same tired strategies over and over again. But continually condemning the North Korean leader doesn't make the world safer and it doesn't help those who live under his rule. Rabin spoke openly of not wanting to shake Arafat's hand on the day the Oslo Accords were signed. But he did. We need to be mindful of the lessons of the past - I don't want to see British prime minister Neville Chamberlain's naive "peace in our time" speech replicated, which only signalled weakness to Hitler before the onslaught of the Second World War. But we also can't avoid the need to make the world a more peaceful place.